Bob Ross had his own TV show, The Joy of Painting on PBS in the 80s and 90s in which he taught painting techniques. His show is currently streaming on Twitch.tv and of course you can always visit his youtube channel to watch episodes. Most people point to the calm and soothing voice of Bob Ross that helps them relax. When engaging in relaxation exercises calm and soothing noises are essential to help us relax which is why nature sounds are often played in relaxation videos and soft instrumental music. By nature we respond positively to these types of noises which is why mothers and fathers “shhhhh” their babies to sleep or just to calm down. Bob Ross encourages creativity. Your decision is the best and it is good. “Whatever you feel to be right is right.” Bob Ross encourages you to make your own decisions and to flow with the techniques he teaches. This helps you to feel empowered and in control. Gaining control is what people with anxiety feel they are lacking. When you are encouraged and empowered you feel in control of your decisions and your life which allows anxiety to dissipate. “Happy” trees…. “tired” branches. Trees have friends and babies and he talks to the trees. Personification helps to promote connectedness with nature that is calming. Personification strikes our empathy bone and as we relate to the “happy” trees and bushes we embody to that happy feeling and feel it as our own. 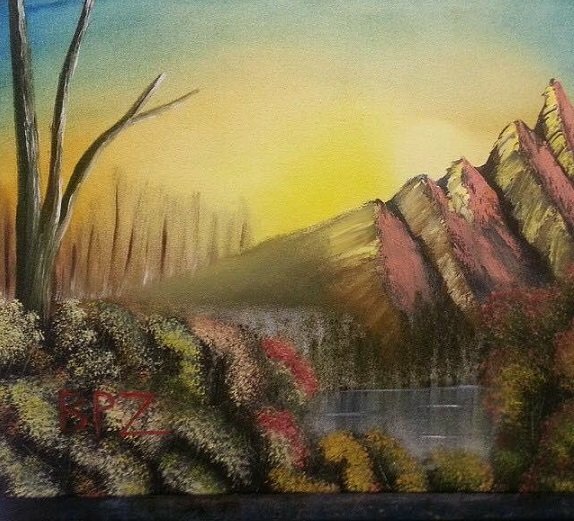 Bob Ross’s attention to detail reminds us to practice mindfulness by noticing the mountains, the leaves, the colors, the water, the ripples and the stillness…. Just sit back and notice without judgement. These are great grounding techniques that help us to feel calm and safe. Even though you may be in your living room watching him paint nature, the TV show simulates a natural experience of how peaceful and relaxing nature can be. This can put your mind in a positive place as if you were in nature and have similar relaxing effects. It also helps us to remind ourselves to be in nature more and recognize the magic of how we feel being a part of it. Bob Ross reminds us to be happy in whatever we do (and not just painting). He reminds us to enjoy the process and every aspect of the journey rather than focusing just on the goal. He encourages us not to be consumed with “doing it right” but doing it your way and whatever way that is that makes you happy. He reminds us to put life into perspective, be joyful, and enjoy the little moments. So if you’re feeling anxious, need some grounding, or practice relaxation, watch Bob Ross and let your anxiety melt away!